More than 100 bartenders, 30+ sponsors, and hundreds of guests gathered at the sixth annual Art Beyond the Glass this past June for an afternoon of cocktails, culture and community. 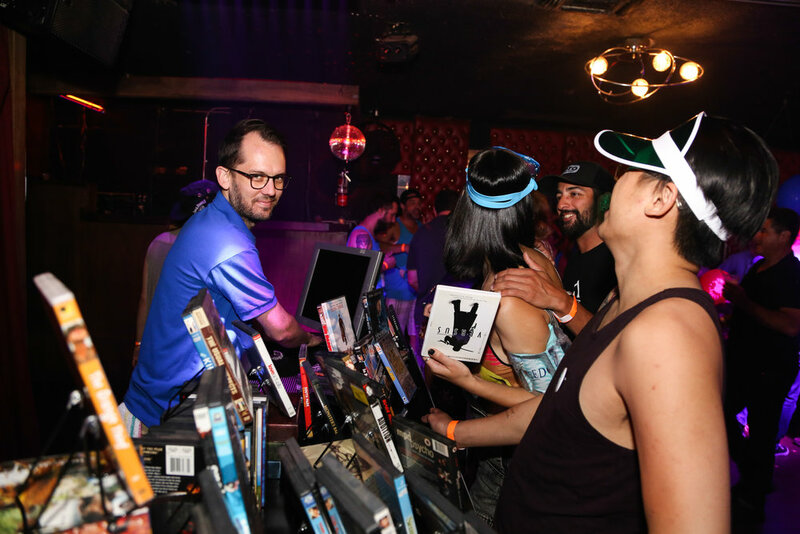 Hosted by whisky legend Martin Daraz, ABTG VI took place at Los Globos, the landmark nightclub located on Sunset Boulevard in the heart of Silver Lake. Opened as L.A.'s first American Legion hall in the 1930s, Los Globos is a massive two-story venue with multiple rooms and state-of-the-art sound and lighting. ABTG took over both levels, with bars set up throughout, live music on the first floor, and DJs rocking the upstairs dance floor. ABTG VI donated over $23,000 to The Moth, which celebrated its 20th anniversary on June 6. The Moth is an award-winning nonprofit that celebrates the ability of stories to honor the diversity and commonality of human experience, and to satisfy a vital human need for connection. 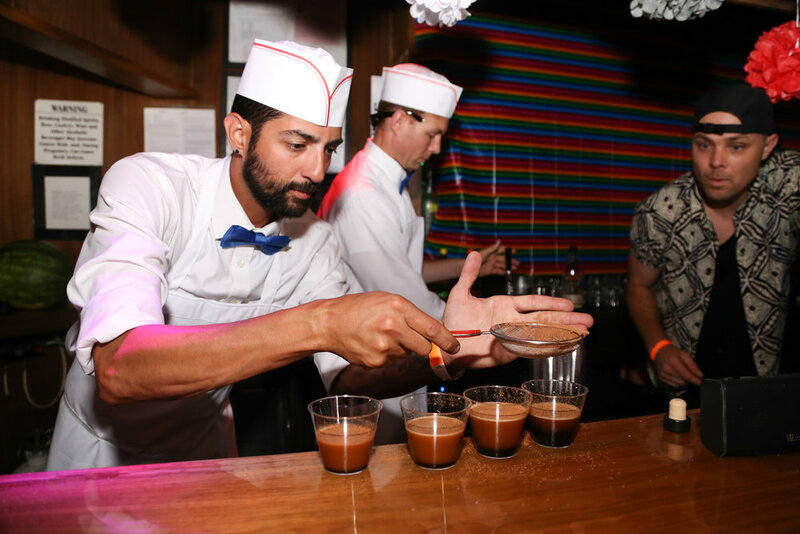 As always, bartenders and their sponsors blew everyone's minds with their collaborations - the creative themes ranged from Jägermeister's "A Midsummer Night's Dram" to 86 Co's CSI: ABTG bar with "case files" and photo booth. Perhaps the most unique theme was Team Michter, which created a "Blockbuster" video store interactive experience! Three months after ABTG VI, the second annual ABTG Oklahoma City raised over $6,300 for the Arts Council Oklahoma City. ABTG OKC once again took place at 51st Street Speakeasy and ABTG co-founder Daniel Djang was in attendance. The USBG OKC chapter was out in force and the art gallery was particularly impressive. For photos of ABTG OKC, visit their Facebook page. The ABTG OKC donation brought the total funds collectively raised by Art Beyond the Glass events to more than $127,000. After the jump, read on for highlights from the biggest Art Beyond the Glass ever. For more photos of ABTG VI by Eugene Lee, visit the Art Beyond the Glass Facebook page. Much love and see you on June 24, 2018! Art Beyond the Glass VI was made possible with the generous support of our sponsors: The 86 Co., Amaro Montenegro, Atlantico, Bacardi, Back Bar Project, Benham's Gin, Black Cow Vodka, Bluecoat Gin, Boomtown Brewery, Carpano Antica, Chareau, Classic & Vintage, Copper & Kings, Cutwater Spirits, Diplomatico, Fernet-Branca, FEW Spirits, Hilhaven Lodge, House Spirits, Ilegal, Infinium Spirits, Jack Daniel's, Jägermeister, Liquid Alchemist, Mestizo Mezcal, McCluskey Group, Michter's, Mulholland Distilling, Peroni, Pernod Venture, Purple Wine + Spirits, Rutte, Samson & Surrey, Seedlip, Spiribam, Stolen, Zignum, Arts District Brewing, Cocktail Academy, Chartreuse, Combier, Dirty Sue, L'Orgeat, Lustau, Miracle Mile Bitters, Q Drinks and West Coast Ice Provisions.